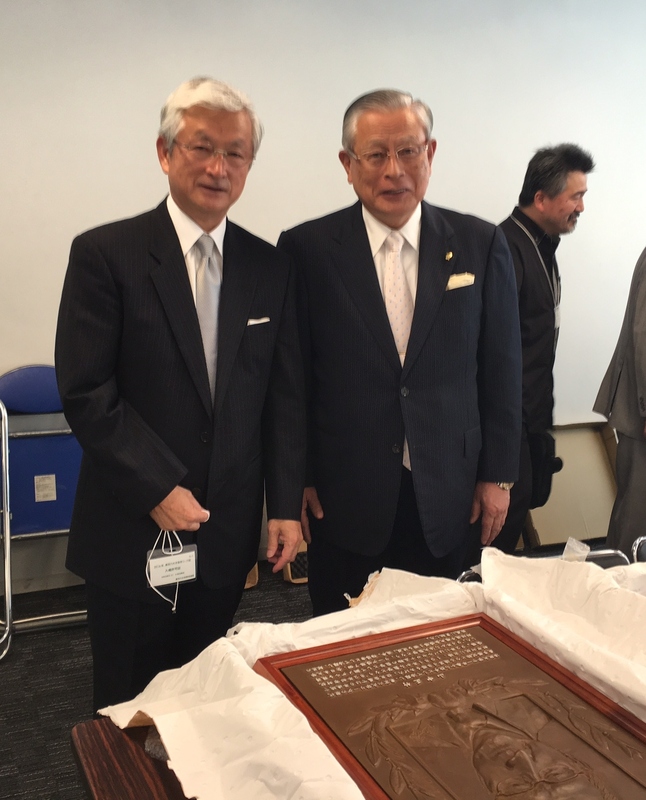 The venue and the game on Saturday, May 28, 2016 were most fitting to honor the two benefactors of student baseball in Japan; i.e. the final matches of Tokyo Big-6 League’s spring tournament between Waseda and Keio. 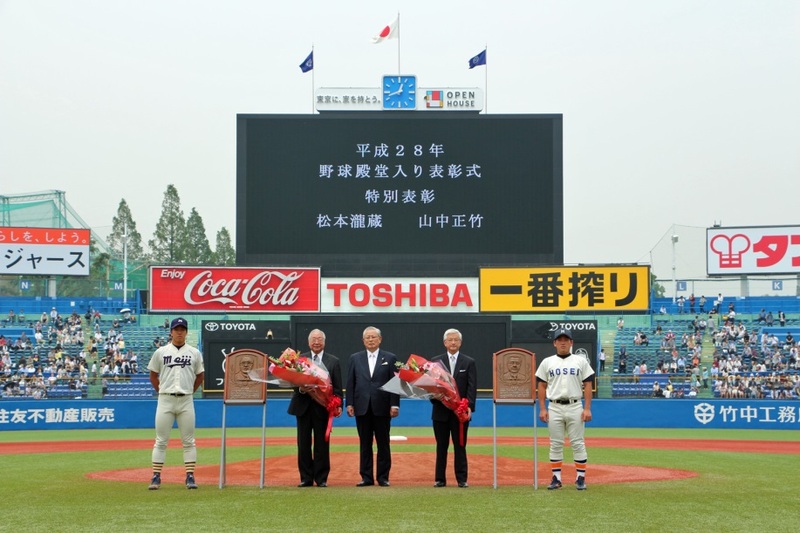 Katsuhiko Kumazaki (74), President of the Baseball Hall of Fame and Museum as well as Commissioner of Nippon Professional Baseball, presented reliefs to Msatake Yamanaka and Mitsuro Matsumoto, son, under the gaze of 26,000 fans with both teams form up in front of the dugouts. Masatake Yamanaka (68), a native of Oita Prefecture, famous amateur baseball skipper and amateur manager, led Team Japan to its first Olympic Medal in baseball at the Barcelona Olympics in 1992. As an ace pitcher at Hosei University, he holds an unbroken record of 48 wins in the Tokyo Big-Six League, played at Sumitomo Metal Baseball Club of industrial league and was its manager in 1981. From 1994 to 2002, he managed Hosei University and worked with NPB’s Yokohama BayStars Club as Executive Managing Director in 2003. After retirement, he was an associate professor of Hosei University and currently serves as Director of Baseball Federation of Japan. At the award ceremony, he said that he owes to Tokyo Big-6 and Jingu Stadium for having taught him preciousness of learning through baseball. He will double his effort to the development of baseball, declared Yamanaka. Late Takizo Matsumoto (1901–1958) spent his boyhood in California to finish Fresno Middle School in 1923 before returning to Hiroshima, studied at Meiji University in Tokyo from 1925 to 1930, brought its baseball team as a student manager on around-the-globe trip in 1929 and taught at Meiji University from 1932 to 1958. During the teaching time at Meiji, he graduated from Harvard Graduate School in 1938. His brilliant carrier includes his involvement in international exchanges in baseball and other sports before and after the WWII such as Berlin Olympics, Helsinki Olympics, Asian Games in Manila, and All American Swimming Championship in Los Angeles in 1949. He helped invite the San Francisco Seals to Japan to play against Japanese clubs in 1949 as an administrator. One for the books is his enormous contribution in resurrecting baseball as a national sport after the WWII. From 1946 to 1958, he served as a member of the Diet and was revered as citizen of the world of sports. Hall of famers in Japan now numbers 192.